Data Logging up to 100 groups: Yes. Use in living and office area, machine room, data storeroom, traffic environment, timely knowing the temperature and humidity, playing an important role in building a healthy life. Use to check the plants living condition, when planting flowers and trees. Use to keep track of bad moister on sound equipment which can harm electronics. Use to check the performance of heating and air conditioning equipment accurately by building engineer. Use to keep careful track of the humidity in wine cellar. HVAC must have well for superheats, fast accurate readings. Wonderful meter for ghost hunters or paranormal investigator. Wet Bulb and Dew point Temperature Measure. -20 to 0°C (-4 to 32°F) 0.1°C/°F (±1.5°C). 0 to 45°C (32 to 113°F) 0.1°C/°F (±0.5°C). 45 to 60°C (113 to 140°F) 0.1°C/°F (±1.5°C). -0 to 45°C (32 to 113°F) 0.1°C/°F (±0.5°C). -50 to 0°C (-58 to 32°F) 0.1°C/°F (±1.5°C). Power supply: 4x 1.5V AAA Battery (Not Included). Size: 184mm x 60mm x 29mm (7.2 x 4 x 1.1 inches). Safety rating: CE CAT.III 300V RoHS. 1 x NKTECH MS6508+ Temperature & Humidity Dew Meter. 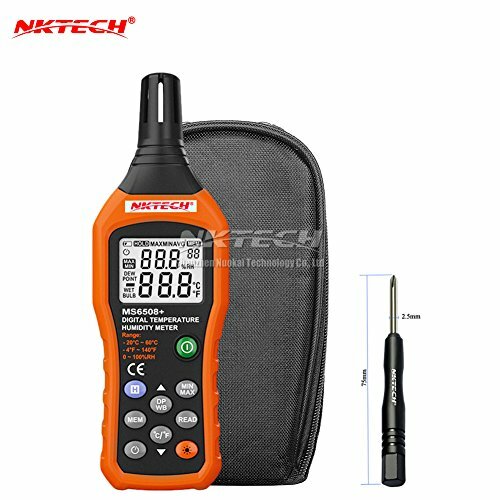 NKTECH MS6508+ Digital Thermometer Hygrometer is a new type of digital temperature and humidity meter, which designed to combine the functions of humidity meter, temperature meter, wet bulb temperature and dew point temperature. And Dew point is a measure of how much water vapor actually in the air. Dual Display Humidity and Temperature with Accurate Measuring: Humidity range: 0% to 100%RH. Temperature range: -20℃ (-4℉) to 60℃(140℉). Dew point Temperature: -50℃ (-58℉) to 60℃ (140℉). Wet Bulb Temperature: -20℃ (-4℉) to 60℃ (140℉). Digital humidity and temperature meter used for a high range of applications-HVAC, industry, agriculture, meteorology, medical, daily life, building engineer, paranormal investigator, in wine cellar, machine room and data storeroom. LCD display with backlight with high accuracy sensor, LCD brighter in the darker places, auto power off after 15 seconds.